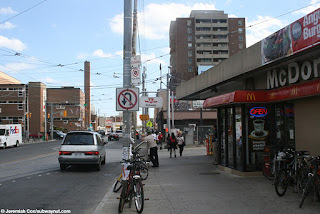 One of the ugliest intersections in this city has to be Dundas West and Bloor Street. It's more undecided and poorly planned than excessively dangerous or any thing of that nature. I often scratch my head wondering why this corner of the city is so lousy. It's central, right at Dundas West subway station, and near great neighbourhoods like Roncesvalles, High Park, the emerging Junction and Junction Triangle. The homes one block away in most directions are well-maintained heritage homes or better-than-average condos. I was thrilled when I heard the styish Giraffe condos were going to go up at this corner a few years ago. The rest of this intersection is populated by the worst of the 60s and 70s - a massive rental building that is not to scale with the rest of the neighbourhood, a high school with a great field behind it that no one can see, and an ugly cement office building that was probably already ugly before it started deteriorating. The Giraffe condos were well-designed, eco-green, and a could have been a great addition to the corner. But alas, the City and the nearby community shot that down. To be honest, I was shocked such a great project was denied, considering some of the giant box condos that get the green light. I can see, though, from a practical perspective how building a large condo on a tiny lot at that location could prove to be a bit of a traffic nightmare on a corner that's pretty congested already. Still, the unpractical side of me was disappointed. Regardless, it is clear that this corner is in desperate need of attention - from Giraffe or elsewhere. And though the City denied Giraffe from developing here with their current plans, the City was crafting some new ideas on how to improve this intersection and other streets around the city. For about 10 years, the city has conducted several "Avenue Studies" throughout Toronto. These streets are designated "avenues" by the city, and must follow certain new by-laws, which are aimed to improve the neighbourhoods around highly-utilized, though not always well-functioning streets. The idea is to make the street use and future development smarter. More densification where developers are encouraged to build higher, but not so high as to look out of wack with the rest of the buildings around it. The building height, for example, along Dundas and Bloor would ideally fall between between 3 and 6 stories for any future build, a consistent building height for this existing neighbourhood. But it's not just about height. The avenue plans of the City also focus on further setbacks from the street to allow for a larger pedestrian sidewalk, more public space, and future development that fits with the design and look of a given neighbourhood. It seems that current Toronto is trying to make up for the poor planning of the the past by encouraging smarter development in select neighbourhoods. What does that mean for buyers? Well, if you are buying near one of the streets that the City has now designated an avenue, then you stand a better chance of price appreciation on your home or condo down once (and if) this "Avenue" plans pan.